mTOR from other species may also be detectable. 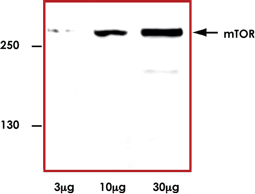 Sample Data :Representative western blot with Anti-mTOR (1:1000) using 3 μg, 10 μg, and 30 μg of HeLa cell lysate. Scientific Background :The mammalian target of rapamycin, mTOR, also known as FRAP or RAFT, is a Ser/Thr protein kinase. mTOR acts as a sensor for ATP and amino acids, balancing the availability of nutrients and cell growth (1). When sufficient nutrients are available, mTOR responds to a phosphatidic acid-mediated signal, transmits a positive signal to p70 S6 kinase and participates in the inactivation of the eIF4E inhibitor, 4E-BP1 (2). 1. Sabers CJ et al: Isolation of a protein target of the FKBP12-rapamycin complex in mammalian cells. J Biol Chem. 270(2): 815-22, 1995. 2. Fang Y. et al: Phosphatidic acid-mediated mitogenic activation of mTOR signaling. Science. 294(5548): 1942-5, 2001.